They absolutely *adore* him on Japanese TV. In the match build-up, they were showing clips from the tournament of him playing, except it was things like an exceptionally normal assist to Keita and an overhead kick which went nowhere near the goal. Japanese people are often in awe of foreign people simply because they’re foreign. Oh, and if that was Messi’s translator on the left, he was doing a rubbish job. Confused???? So I’m I ! ! ! Maybe they should have asked him about the drug enhancements he took during the age of 9 – 16. When he was cured of his so called growth illness? If he continue treatment after being cured? And if he thinks Ronaldo would get the same treatment if he had this dodgey past? Worlds Greatest – Human Experiment! At first Messi is like, no interviews. Then they tell him its only one question and he’s like, ok, quick because I want to go celebrate. They asked him: What will your life be like after your retirement? Answer: I’m not thinking about my retirement. Thought you’re on drugs, Rico? Whats wrong with these people? Can’t they get a decent English Japanese speaker to translate? Idiots! i think you’re confusing him with Xavi. Messi has made his career out of making explosive runs with his powerful lower body. His game is based on speed, acceleration, strength and agility. Cristiano has always been a more technical footballer, at any point in their careers. 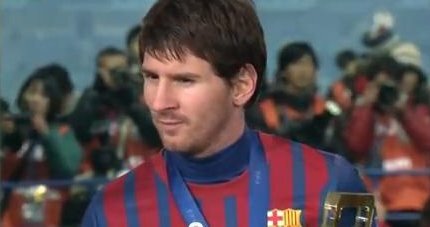 For a long time Messi was a fairly one dimensional pacey winger, even if he was the best one since he was 19. Awww. The key’s bigger than Messi. Awwwwwww. Who GOD has bless no man can couse.MESSI IS STILL DE BEST 4 NOW. We should leave SENTIMENT let appreciate good things so that GOOD THINGS WLL FOLLOW US. UP BARCA. @Sam: What makes you think he can speak English?